Dr Kai Syng Tan’s ‘We sat on a mat and had a chat and made maps! #MagicCarpet’ is a practice-led research project weaving science and art together to celebrate mind wandering, magic carpets, mapping, making, making small talk and productive antagonisms. 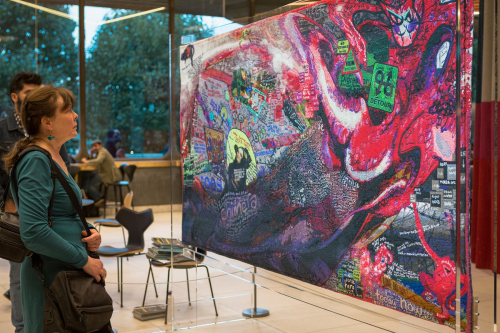 Kai Syng Tan delivered a talk and had one of her tapestries on display at Southbank Centre as part of Unlimited Festival. Review by James Zatka-Haas. Figuring out where to begin on Kai Syng Tan’s Unlimited commission #MagicCarpet is difficult, not because the work is unnecessarily complex – the aims are in fact quite simple. Rather, the multi-faceted approach blending talks, debates, visual art and workshops has built up a project that feels greater than its single visual element (a tapestry), so finding a root for this critique has to acknowledge that the work, like the science behind it, is ever evolving. Kai wants to discuss ADHD (Attention Deficit / Hyperactivity Disorder), how we think about it as a society, the implications of a diagnosis and the falsehoods attached to it. Her work situates itself at the crossroads between scholarship, scientific inquiry and art, but seems ever evasive of any of those categories. Kai uses the subject of ADHD and how that relates to mind wandering (and vice versa), seeing how we could radically change our relationship to the ‘disorder’. Kai worked with Professor of Molecular Psychiatry Phillip Anderson of King’s College London’ as an initiation. This dialogue between the two worlds of art and science, and how that could be interpreted, culminated in a tapestry printed by Flanders Tapestries in Belgium, the same company that has made work for artist Grayson Perry. The tapestry itself was developed by Kai using just an Ipad, but when you look at it, it’s hard to believe that was purely the case. The tapestry is dense, visually and thoughtfully. It’s a voyage through Kai’s mind. 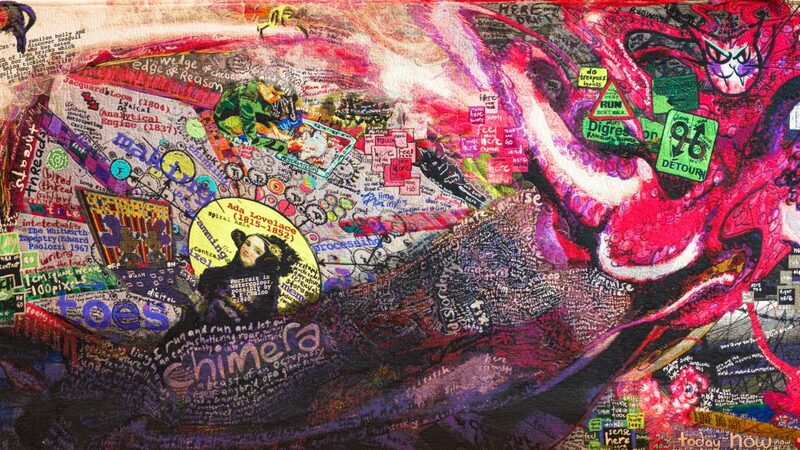 A portrait of Mathematician Ada Lovelace sits on top of streams of text. The text runs throughout in seemingly infinite amounts, appearing at first legible, then running off into a black murky void. Everything about the tapestry screams at you, and it is beautiful for that reason. There’s so much going on that you really want to touch it, explore every nook and cranny, uncover its secrets through returning to it again and again. This need to interact with the tapestry makes it perfectly suited for its use; a rug where participants can sit with Kai, Professor Anderson or others to discuss mind wandering – their thoughts and experiences with it. Given the evolving nature of the work, it’s ideal that the tapestry rewards multiple interactions. Kai mentioned in the talk that one of the symptoms of ADHD is quick paced mind jumping from one topic to another, without the sense of focus on a particular subject. It’s a symptom of its own benefits and relative drawbacks and is illustrated well in the tapestry itself. There’s an emphasis on making connections, either visually through the art or with the many disciplines involved in its conception. ‘We are not here to find answers’ mentions Kai in her talk, ‘but to instead create a space where we can think critically about mind wandering, unlearn some of these negative presuppositions and promote new ways of thinking about ADHD.’ The work explores what is unfixed and what is unfixable, saying that what is normal for you may not necessarily be normal for me, and if we collectively (in the art and science world) learn to better accept these diverse perspectives, we can enrich the world with new ways of seeing. Find out more about Kai Syng Tan’s work on her website or the MagicCarpet Weebly.